Most currently known breast cancer predisposition genes play a role in DNA repair by homologous recombination. Recent studies conducted on RAD51 paralogs, involved in the same DNA repair pathway, have identified rare germline mutations conferring breast and/or ovarian cancer predisposition in the RAD51C, RAD51D and XRCC2 genes. The present study analysed the five RAD51 paralogs (RAD51B, RAD51C, RAD51D, XRCC2, XRCC3) to estimate their contribution to breast and ovarian cancer predisposition. The study was conducted on 142 unrelated patients with breast and/or ovarian cancer either with early onset or with a breast/ovarian cancer family history. Patients were referred to a French family cancer clinic and had been previously tested negative for a BRCA1/2 mutation. Coding sequences of the five genes were analysed by EMMA (Enhanced Mismatch Mutation Analysis). Detected variants were characterized by Sanger sequencing analysis. Three splicing mutations and two likely deleterious missense variants were identified: RAD51B c.452 + 3A > G, RAD51C c.706-2A > G, RAD51C c.1026 + 5_1026 + 7del, RAD51B c.475C > T/p.Arg159Cys and XRCC3 c.448C > T/p.Arg150Cys. No RAD51D and XRCC2 gene mutations were detected. These mutations and variants were detected in families with both breast and ovarian cancers, except for the RAD51B c.475C > T/p.Arg159Cys variant that occurred in a family with 3 breast cancer cases. This study identified the first RAD51B mutation in a breast and ovarian cancer family and is the first report of XRCC3 mutation analysis in breast and ovarian cancer. It confirms that RAD51 paralog mutations confer breast and ovarian cancer predisposition and are rare events. In view of the low frequency of RAD51 paralog mutations, international collaboration of family cancer clinics will be required to more accurately estimate their penetrance and establish clinical guidelines in carrier individuals. Breast cancer is currently the most common cancer and the leading cause of cancer deaths in women worldwide . Abnormal familial aggregations fitting a model of autosomal dominant breast cancer genetic predisposition account for about 5% of cases . BRCA1 and BRCA2 are the two major genes, but explain only about 20% of inherited breast cancers [3–5]. About ten genes are known to be involved in breast cancer predisposition, either isolated or associated with other cancers, with variable breast cancer risks. Approximately 50% of familial breast cancers remain unresolved by any of these genes after genetic testing . Most currently known breast cancer predisposition genes play a role in the repair of DNA double-strand breaks by homologous recombination: BRCA1 and BRCA2, associated with a high risk of breast cancer, and BRIP1 and PALB2, associated with a moderate risk [7–9]. While breast cancer predisposition is conferred by mono-allelic germline mutations in these genes, bi-allelic germline mutations in BRCA2, BRIP1 and PALB2 result in Fanconi anaemia, an autosomal recessive inherited syndrome characterized by multiple developmental abnormalities and predisposition to various cancers [10–12]. Genetic studies were recently conducted on the RAD51 paralogs, involved in the same DNA repair pathway: BRCA2 protein loads RAD51 monomers at DNA double-strand break sites; RAD51 recruitment also depends on the RAD51 paralog family . Bi-allelic mutations resulting in Fanconi anaemia were identified in RAD51C and XRCC2[14, 15]. Mono-allelic germline mutations conferring breast and ovarian cancer predisposition were identified in RAD51C and RAD51D[16, 17]. XRCC2 mutations were then detected in breast cancer families but a subsequent population-based study failed to confirm an association between XRCC2 variants and breast cancer risk [18, 19]. Johnson et al. conducted a study on RAD51B in breast cancer families and did not detect any mutations . The XRCC3 gene has not yet been studied. In this study, we analysed the five RAD51 paralogs (RAD51B, RAD51C, RAD51D, XRCC2, XRCC3) in 142 unrelated patients with breast and/or ovarian cancer to estimate their contribution to breast and ovarian cancer predisposition. The study was conducted on 142 unrelated patients with breast and/or ovarian cancer either with early onset or with a breast/ovarian cancer family history. Patients had been previously tested negative for a BRCA1/2 mutation, selected either for a predisposition probability higher than 70% according to the Claus model  or for enrichment in ovarian cancer cases: 87 patients (61%) had a personal or family history of both breast and ovarian cancer, 10 patients (7%) had a personal or family history of ovarian cancer only and 45 patients (32%) had a personal or family history of breast cancer only (Table 1). All patients attended a visit with a geneticist and a genetic counsellor in a family cancer clinic, mostly at the Institut Curie, Paris, France. Patients gave their informed consent for genetic testing. The study was approved by the local Ethics Committee in Institut Curie. *Family history was defined in first- or second-degree relatives in the same lineage. Genomic DNA was extracted from 2 mL whole-blood samples collected on EDTA with the Quickgene 610-L automated system (Fujifilm) according to the manufacturer’s instructions. RAD51 paralog mutation screening was performed on coding exons and exon-intron junctions by multiplex PCR and Enhanced Mismatch Mutation Analysis (EMMA)  except for 2 RAD51B exons which were analysed by simplex PCR and direct sequencing (Additional file 1: Table S1 and Additional file 2: Table S2). PCR products showing abnormal EMMA profiles were analysed by sequencing on an ABI PRISM 3130XL Genetic analyzer (Applied Biosystems). RNA was extracted from lymphoblastoid cell lines using TRIzol reagent according to the manufacturer’s instructions (Invitrogen). 2 μg of total RNA from each sample was used for reverse transcription in a 40 μL reaction using the GeneAmp RNA PCR Core kit according to the manufacturer’s instructions (Applied Biosystems). cDNA was amplified with forward and reverse primers gcattcagcaccttcagctt and ctttcggtcccaatgaaaga for RAD51C exon 5 skipping, tgacctgtctcttcgtactcg and for RAD51C exon 8 skipping. For RAD51B immunostaining, 4-μm-thick paraffin sections were cut and mounted on glass slides (Superfrost+, Menzel Glazer). Preparations were dried for one hour at 58°C, then overnight at 37°C. Sections were deparaffined with toluene and rehydrated with ethanol. Preparations were pretreated with citrate buffer (0.01 M citric acid pH 6.0), and a heat-based antigen retrieval method was used prior to incubations. Endogenous peroxidase was blocked using 3% hydrogen peroxidase solution for 5 minutes. The primary anti-RAD51B antibody used (clone NBP1-66539, dilution 1/200) was from Novus Biologicals. Sections were incubated for 15 minutes at 22°C with the primary antibody followed by staining with anti-rabbit HRP antibody (Leica Biosystems) for 10 minutes. Sections were then revealed in a diaminobenzidine solution for 15 minutes and stained with hematoxylin for 7 minutes. Three bioinformatics tools were used for missense variants pathogenic prediction: Align-GVGD [22, 23], SIFT [24, 25] and Polyphen-2 [26, 27]. Multiple sequence alignment (MSA) for Align-GVGD and SIFT analysis was an alignment of protein sequences of 11 species: Human (Homo sapiens), Chimpanzee (Pan troglodytes), Macaque (Macaca mulatta), Mouse (Mus musculus), Rabbit (Oryctolagus cuniculus), Dog (Canis familiaris), Cat (Felis catus), Bovine (Bos taurus), Opossum (Monodelphis domestica), Platypus (Ornithorynchus anatinus), Chicken (Gallus gallus) and Frog (Xenopus tropicalis). Missense variants were interpreted as likely deleterious if they were classified as deleterious or probably damaging by the three tools. Frequencies of mutations and likely deleterious variants were compared between the cases and two control samples from online databases: European-American controls from Exome Variant Server  and European controls from 1000 Genomes project . In a first step the two control sample variant frequencies were compared using Fisher’s exact test in order to check there was no significant difference. In a second step the control samples were pooled and the overall control variant frequency was compared with the case sample one, using Fisher’s exact test. All the tests were two-sided, with a p-value of 0.05 considered significant. Computations were performed using the XLSTAT-2013 software. Three splicing mutations and two likely deleterious missense variants were identified in these 142 patients: RAD51B c.452 + 3A > G, RAD51C c.706-2A > G, RAD51C c.1026 + 5_1026 + 7del, RAD51B c.475C > T/p.Arg159Cys and XRCC3 c.448C > T/p.Arg150Cys (Table 2). No mutation was detected in the RAD51D and XRCC2 genes (See Additional file 3: Table S3 for all variants and polymorphisms detected in this study). BC: Breast cancer, OC: Ovarian cancer, PC: Pancreas cancer, UC: Uterine cancer, SC: Stomach cancer. †Align-Grantham Variation Grantham Deviation (Align-GVGD) classes range from C0 to C65; C65 class variants are the most likely to interfere with protein function [22, 23]. §This paternal aunt also carried the RAD51C c.706-2A > G mutation. ‡Frequency in controls in online databases: Exome Variant Server , dbSNP , 1000 Genomes . The three splicing mutations have never been described. The 2 missense variants were reported only in Exome Variant Server, in European-American populations. Their frequencies in European-American populations are reported in this table. All variants detected on DNA were tested by in silico splicing effect prediction according to a previously published pipeline : a greater than 15% decrease of the MaxEntScan score for donor/acceptor splice sites and a greater than 5% decrease of the SpliceSiteFinder-like score for donor/acceptor splice sites were considered to be significant with 96% sensitivity and 83% specificity. Three variants were likely to alter splicing according to this pipeline: RAD51C c.706-2A > G and c.1026 + 5_1026 + 7del, and RAD51B c.452 + 3A > G. Exon skipping was confirmed by mRNA analysis for the two RAD51C mutations (Figure 1). No RNA was available to study the impact of the RAD51B c.452 + 3A > G mutation but, using immunohistochemistry with anti-RAD51B antibody, loss of expression of RAD51B protein was observed in breast carcinoma cells from the patient bearing this mutation, as compared with that detected in the nucleus of normal duct cells (Figure 2). mRNA analysis for RAD51C splicing mutations showing exon skipping. (A) Electropherograms of Sanger sequencing analysis for a control sample with wild type RAD51C mRNA only (left) and for RAD51C c.706-2A > G mutation with two types of mRNA: wild type mRNA and mRNA with exon 5 skipping (right). (B) Electropherograms of Sanger sequencing analysis for a control sample with wild type RAD51C mRNA only (left) and for RAD51C c.1026 + 5_1026 + 7del mutation with two types of mRNA: wild type mRNA and mRNA with exon 8 skipping (right). RAD51B immunohistochemistry in breast tissue of patient carrying the RAD51B c.452 + 3A > G mutation. 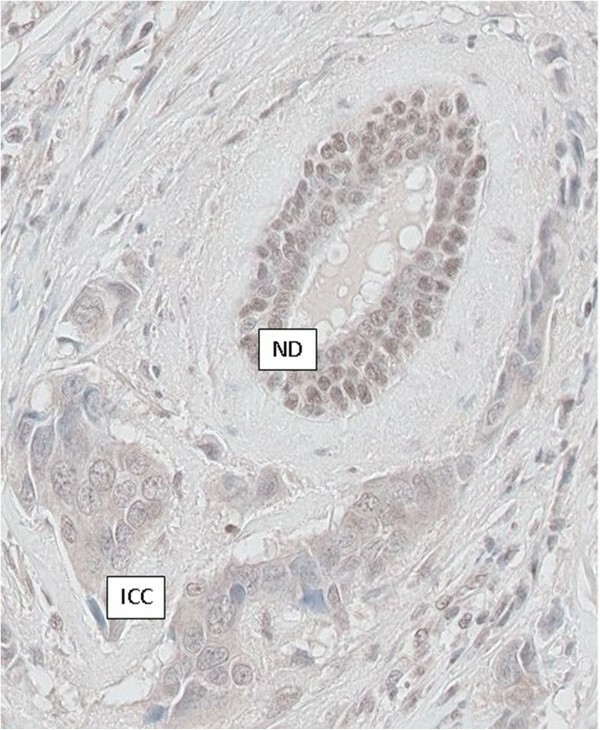 A brown staining of moderate intensity is observed in the nucleus of non tumor epithelial cells located in normal duct (ND) of the breast tissue. In comparison, no significant staining is detected in the nucleus of invasive carcinoma cells (ICC). Likely deleterious missense variants reported in this study in the RAD51B and XRCC3 genes are located in the ATP-binding domain of the proteins and result in the replacement of highly conserved amino acids with subsequent high Grantham score (Table 2). Mutations and likely deleterious variants were detected in families with both breast and ovarian cancers, except for the RAD51B p.Arg159Cys variant that occurred in a family with 3 breast cancer cases (Figure 3). The RAD51C c.706-2A > G mutation co-segregated with an ovarian cancer at the age of 67 years for a paternal aunt of the index case. No other co-segregation studies have been performed to date. Pedigrees for RAD51 paralog mutation and likely causal variant carriers. Individuals with breast cancer (BC) are shown as red circles, ovarian cancer (OC) as purple circles, and other cancers as blue circles. SC: stomach cancer; UC: uterine cancer; PC: pancreas cancer. Disease and age in years at diagnosis are given underneath the symbol. The index case is indicated with an arrow. No co-segregation studies have yet been performed, except for RAD51C c.706-2A > G: tested relative with OC carried the mutation, indicated by (+). This study reports RAD51 paralog analysis in breast and ovarian cancer cases. To our knowledge, this is the first report of a RAD51B mutation and evaluation of the contribution of the XRCC3 gene to breast and ovarian cancer predisposition. We identified a RAD51B mutation and a likely deleterious variant in two patients: the RAD51B c.452 + 3A > G mutation was detected in a breast and ovarian cancer family case and the RAD51B p.Arg159Cys variant was detected in a family with 3 breast cancer cases. RAD51B has been previously evaluated as a candidate gene for breast cancer predisposition but no mutation was detected in a study of 188 multiple breast cancer family cases (Johnson et al.). The low frequency of RAD51B mutations may account for the differences observed between our results and those reported by Johnson et al., as previously described for RAD51C, RAD51D and XRCC2[16–18]. More generally concerning RAD51B involvement in cancer, previous studies have identified chromosomal rearrangements disrupting RAD51B in benign tumours, particularly uterine leiomyomas [31, 32]. Overall, haploinsufficiency of RAD51B was shown to induce genomic instability in human cells, suggesting its involvement in cancer predisposition . In addition, our findings must be interpreted in the context of two genome-wide association studies (GWAS) that identified the minor allele of single nucleotide polymorphisms (SNPs) in RAD51B acting as low risk factors for breast cancer: rs999737  and rs1314913 , located in RAD51B introns 10 and 7, respectively. Overall, these findings might indicate that RAD51B acts as a susceptibility factor or as a major gene depending on the context. Indeed, it cannot be excluded that the minor allele of these SNPs indirectly reflects a major influence of RAD51B, as a recent study showed that high risk rare mutations can account for some synthetic associations identified by GWAS . RAD51B c.452 + 3A > G is a novel mutation. Several arguments strongly support its causality: this variation is absent in the thousands of controls tested in online databases (Exome Variant Server , dbSNP , 1000 Genomes ); in silico prediction concluded this variation was likely to result in an out-of-frame exon skipping leading to a truncated or unstable protein; RAD51B immunohistochemistry in breast carcinoma cells of the patient bearing this variation showed a loss of expression of RAD51B. The RAD51B p.Arg159Cys variant is reported in Exome Variant Server: this variant was detected in 2 out of 4,299 controls in European-American populations. We consider this variant to be a likely deleterious variant because it occurs in a functional domain and results in replacement of a highly conserved amino acid with subsequent high Grantham score and Align-Grantham Variation Grantham Deviation (Align-GVGD) maximum score (C65), and very low frequencies are reported in Exome Variant Server. Its occurrence in controls could be explained by an incomplete penetrance. Overall, for the RAD51B gene, one truncating mutation and one likely deleterious variant were detected in 2 out of 142 patients selected for enrichment in breast/ovarian cancer cases. In online databases, one truncating mutation and two likely deleterious variants were detected in 4 out of 4,678 controls (Additional file 4: Table S4). Frequency of RAD51B variants was significantly higher in cases (p = 0.012), which suggests RAD51B variants are associated with breast/ovarian cancer risks. 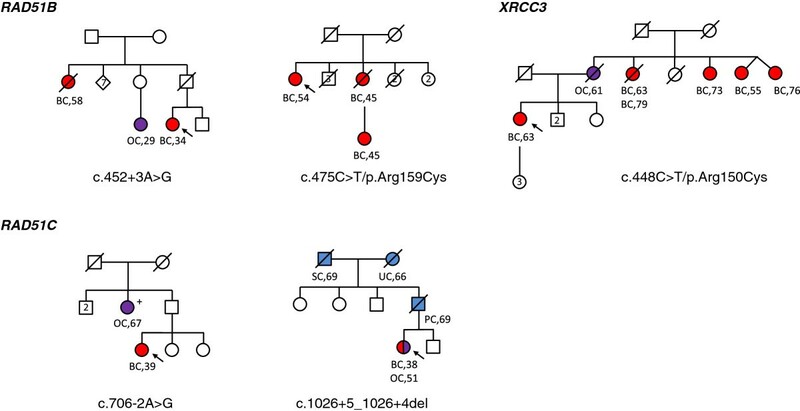 The XRCC3 p.Arg150Cys variant was detected in a family with 1 ovarian cancer and 5 breast cancer cases. Like the RAD51B missense variant reported in this study, the XRCC3 p.Arg150Cys variant is reported with a very low frequency in Exome Variant Server (1 out of 4,276 controls in European-American populations). We consider this variant to be a likely deleterious variant because it occurs in a functional domain and results in replacement of a highly conserved amino acid with subsequent high Grantham score and Align-GVGD maximum score (C65). This study is the first report of XRCC3 mutation screening in breast and ovarian cancer predisposition. Numerous association studies have evaluated XRCC3 SNPs as candidate risk factors for breast cancer, but the results of these studies remain controversial. A recent meta-analysis suggested that the minor allele of XRCC3 p.Thr241Met SNP was a low risk factor and XRCC3 IVS5-14A > G SNP a low protective factor for breast cancer . Several studies have reported RAD51C causal mutations in breast and ovarian cancer predisposition [16, 40, 41]. Two novel RAD51C splicing mutations are reported in this study: RAD51C c.1026 + 5_1026 + 7del mutation is truncating, resulting in an out-of-frame exon 8 skipping and RAD51C c.706-2A > G mutation leads to the loss of 44 amino acids in a functional domain of the protein by an in-frame exon 5 skipping. These two RAD51C mutations were detected in families with both breast and ovarian cancer cases, which is consistent with previous studies. As this set of patients was enriched with ovarian cancer cases and due to the low frequency of RAD51C mutations, other studies must be conducted in larger series to evaluate whether RAD51C confers predisposition to ovarian cancer alone or to both breast and ovarian cancer, which remains controversial . This study identified the first RAD51B mutation in a breast and ovarian cancer family and confirmed that RAD51 paralog mutations confer breast and ovarian cancer predisposition and are rare events. Identification of families with mutations in the RAD51B, RAD51C or XRCC3 genes and genetic testing of family members could be used to estimate the associated breast and ovarian cancer risks. In view of the low frequency of RAD51 paralog mutations, international collaboration of family cancer clinics will be required to more accurately estimate their penetrance and establish clinical guidelines. Such studies would be facilitated by the development of Next Generation Sequencing allowing laboratories to simultaneously analyse numerous genes. Lisa Golmard, Virginie Caux-Moncoutier contributed equally to this work. We thank Isabelle Eugène, Catherine Gilbon, Karin Maciotta, Sandrine Miglierina and Catherine Rougeron for helpful support during the course of this study, and the Institut Curie Breast Cancer group for referring patients. This work was supported by INCa Recherche Translationnelle grant number 4521000377. LG evaluated and interpreted the data, and wrote the paper. VM was involved in design of mutation analysis by EMMA and Sanger sequencing, data analysis and interpretation. GD, EA, BP, CT, DM, CB and CDD performed part of the mutation analysis and interpretation of the data. LC analysed and evaluated part of the data of mutation analysis. AN and XSG were involved in design, evaluation and interpretation of the data of RAD51B immunohistochemistry. MHS, CH and DSL were involved in conception and design of the study, data interpretation and writing the paper. All authors have critically revised and approved the submitted paper.